Yes, running backs appear to have become nearly a dime a dozen in the pass-heavy NFL, but there are a handful of props on tailbacks with which I would like to start my NFL Week 3 specials recommendations. Let’s start with Buffalo’s C.J. 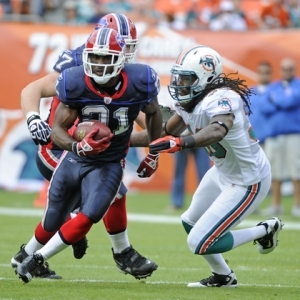 Spiller, who is finally living up to his first-round hype out of Clemson in 2010. Spiller wasn’t a dominant force in his first two seasons mainly because the Bills had a very good back in place in Fred Jackson but not a very good quarterback, so defenses could focus on the running game. The best thing to happen to Spiller was when Jackson went down with a knee sprain in Week 1. The original diagnosis was Jackson would miss up to two months, but apparently he is ahead of schedule and could be back in a few weeks. He better get back soon because Spiller may render Jackson unnecessary and a potential cap casualty after the season. Spiller followed a 14-carry, 169-yard effort in Week 1 vs. the Jets with a 15-carry, 123-yard game last Sunday in a win over Kansas City. He leads the NFL with 292 yards and also is tops with a whopping 10.1 yards-per-carry average – that’s almost De’Anthony Thomas like! There are two Bovada Week 3 specials for Spiller: “over/under” 5.0 yards per carry at Cleveland (both -115) and 5.2 yards per carry for the 2012 season (under a -130 favorite). This week, Spiller goes against a Browns defense that ranks No. 18 in the NFL, allowing 115.0 yards per game (4.2 yards per catch). In Week 1, Philly’s LeSean McCoy had 110 yards on 20 carries, so a 5.5 ypc average. Last Sunday, Cincinnati’s BenJarvus Green-Ellis was held to 75 yards on 21 carries (3.6 ypc). Cleveland is one of the NFL’s worst teams against the pass, so if this were, say, a 100-yard prop on Spiller I would say under. But I would go with the over 5.0 ypc carries this week because QB Ryan Fitzpatrick should be able to exploit that pass defense and, thus, open up the field for potential big runs for Spiller. I do not, however, recommend the over 5.2 ypc for the season. First off, Jackson will be back and vulture some carries. That, therefore, lessens the chances of a big run for Spiller to pad his ypc average (I suppose you could argue it also lessens the chances of runs for losses too). Spiller averaged exactly 5.2 ypc last season while splitting time with Jackson, who averaged 5.6. No player with 200 carries averaged more than 5.0 ypc a year ago (the leader was Panthers QB Cam Newton at 5.6). So it appears that the more carries a back gets, the more likely his average is to come down. One of the other big running back stories in 2012 is Tennessee’s Chris Johnson, who has totaled 21 yards on 19 carries so far. That’s 1.1 ypc. You could trip over a lineman’s foot and average 1.2 ypc. Here are a few players with more rushing yards this season than Johnson: receivers Mario Manningham and Brandon LaFell and quarterbacks Andrew Luck, Brandon Weeden and Tennessee’s own Jake Locker. I hit on Johnson last week as his Bovada total for rushing yards vs. San Diego was set at 62.5. I recommended the under and obviously that was a winner. This week there are three props on Johnson: over/under 3.5 yards per carry (over -130, under even), longest rush of 14.5 yards (both -115) and an average of 3.8 yards per carry for the season (under -130, over even). The Titans host the Lions this week and Detroit is No. 17 in the NFL in allowing 4.2 yards per carry. The Lions have faced the Rams’ Steven Jackson and Niners’ Frank Gore so far. Johnson obviously hasn’t had a long of 14.5 yards this season but did in four of his final six games last year. Johnson also averaged 4.0 ypc last season, which wasn’t a great season. I like over on all three props. Also at Bovada is an over/under prop on how many games this season the Packers have a 100-yard rusher. The over is -175 and the under +145. Over seems easy, right? Not so fast, my friend. Green Bay has gone 29 straight regular-season games without a 100-yard rusher, more than twice as long as any other team. Cedric Benson has emerged as the team’s No. 1 back. After a slow Week 1, Benson had a solid 81 yards on 20 carries in Week 2 vs. Chicago. He rushed for 100 yards three times a season ago. I would take the under here as Green Bay generally throws too much to give any back enough carries for 100. Finally, on Sportsbook.ag the favorite to be the leading rusher in Week 3 (Sunday games only) is Jacksonville’s Maurice-Jones Drew at +300. My pick last week as the Cowboys’ DeMarco Murray at +600 and he was stifled in Seattle. Miami’s Reggie Bush won the prop with 172 yards vs. Oakland. MJD faces a Colts defense that is No. 14 against the run. With no Rashad Jennings (injured) behind him, it will be all Jones-Drew again this week. But the Colts won’t fear Blaine Gabbert and will focus on Jones-Drew. I like Baltimore’s Ray Rice at +800 vs. New England. Rice was contained in last season’s AFC title game, but he has had two good regular-season games vs. the Pats in his career. Rice is also averaging 6.4 ypc so far in 2012. New England has been good against the rush through two weeks, but hasn’t faced a back like Rice (the Pats faced Johnson but obviously he’s a bit off right now).